Little is known about the impacts of health literacy and English proficiency on the health status of Somali refugees. Data came from interviews in 2009–2011 of 411 adult Somali refugees recently resettled in Massachusetts. English proficiency, health literacy, and physical and mental health were measured using the Basic English Skills Test Plus, the Short Test of Health Literacy in Adults, and the Physical and Mental Component Summaries of the Short Form-12. Associations were analyzed using multiple linear regression. In adjusted analyses, higher English proficiency was associated with worse mental health in males. English proficiency was not associated with physical health. Health literacy was associated with neither physical nor mental health. 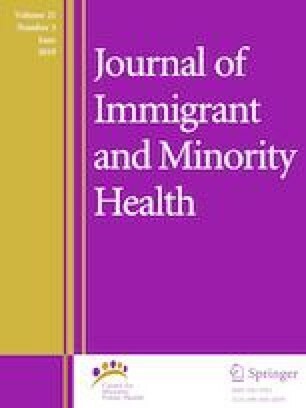 Language proficiency may adversely affect the mental health of male Somali refugees, contrary to findings in other immigrant groups. Research on underlying mechanisms and opportunities to understand this relationship are needed. This research was funded by the National Institute of Dental and Craniofacial Research (Grant 1R01DE017716-01A2, Geltman, PI). Dr. Murphy was funded by a training grant through the Health Resources and Services Administration (Grant D33HP25766). United States Department of Homeland Security, Yearbook of immigration statistics. https://www.dhs.gov/publication/immigration-statistics-2009-wcm-survey-target-id. Accessed 14 Apr 2016. Lehman DV, Eno O. The Somali Bantu: their history and culture. Center for applied linguistics culture profiles; 2003. http://www.hartfordinfo.org/issues/wsd/immigrants/somali_bantu.pdf. Accessed 14 Apr 2016. Stephen P. Somali Bantu report. International organization for migration; 2002. http://www.brycs.org/documents/upload/bantureport.pdf. Accessed 14 Apr 2016. Putman DB, Noor MC. The Somalis: their history and culture. Center for applied linguistics; 1993. http://www.mbali.info/doc415.htm. Accessed 14 Apr 2016. Capps R, Newland K, et al., The integration outcomes of U.S. refugees: successes and challenges. Migration Policy Institute; 2015. http://www.migrationpolicy.org/sites/default/files/...UsRefugeeOutcomes-FINALWEB.pdf. Accessed 19 June 2017. Rootman I, Gordon-El-Bihbety D, A vision for a health literate Canada. Report of the expert panel on health literacy. Canadian Publich Health Association; 2008. http://physicalactivitystrategy.ca/pdfs/Health_Literacy.pdf. Accessed 19 June 2017. Center for Applied Linguistics CfA. BEST plus. In: Adult English proficiency assessments. 2010; http://www.cal.org/aea/bestplus/index.html. Accessed 23 Nov 2016. Center for Applied Linguistics, BEST plus 2.0 technical report. 2015, Center for applied linguistics, http://www.cal.org/aea/pdfs/BP2.0-Technical-Report.pdf. Accessed 12 July 2017.